In our line of work, regular hearing tests are an important part of protecting ourselves and our livelihoods. I just went for my annual test, so I’ll explain the testing processas well as how to interpret the results. 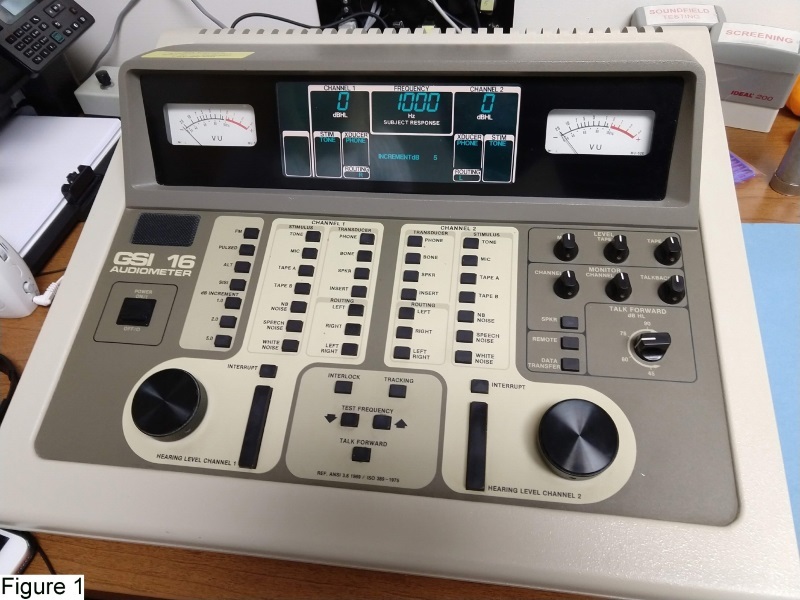 The tones are produced by a calibrated machine called an audiometer (Figure 1). The tones get quieter until the individual can no longer hear them, at which point the audiologist will mark down the threshold for that frequency. The whole process only takes a few minutes. The results of the test are shown on a chart called an audiogram. Figure 2 shows my recent test results. 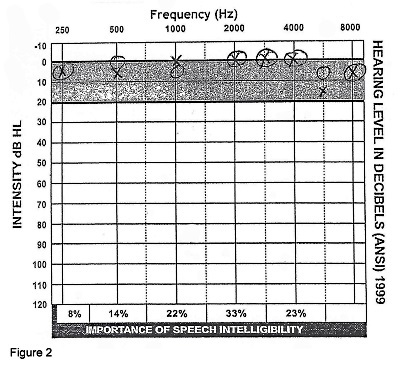 The vertical scale is dB HL (hearing level) with 0 dB across the top representing “perfect” human hearing. (More technically, 0 dB is normalized to the lowest equal-loudness contour, or 0 phons, so the sensitivity of human hearing over frequency is accounted for.) “X” represents data points for the left ear, while “O” (circles) represent the right. Because we can’t fix our hearing once we’ve damaged it, the best plan is to spot trends. I keep a file of annual audiograms so I can compare year to year. If your hearing looks slightly worse than previous years, don’t panic. Small variations are considered normal, and day-to-day variations in the test results are expected and can be caused by a variety of factors including blood pressure and time of day. The test is usually conducted using 5dB measurement intervals, and I was initially curious as to why higher resolution wasn’t used. According to the “Handbook of Clinical Audiology,” test-to-test variations of +/- 5 dB are normal, so using smaller intervals wouldn’t create statistically significant data. I asked my audiologist what she would consider a significant indication of a problem, and she said she’d be concerned about -15 dB or more for three consecutive frequency points. 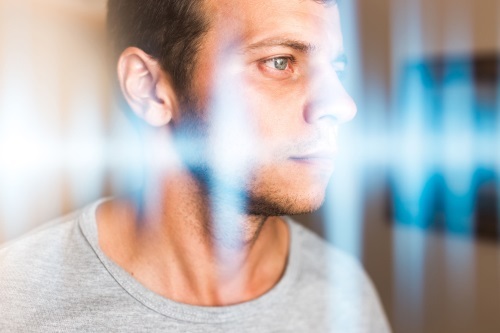 If a test shows hearing loss, the audiologist can administer a bone conduction test, which uses a vibrating transducer to help determine where hearing loss has occurred: conductive (middle ear) or sensorineural (inner ear/nervous system). Once I told her I was working on an article, my audiologist also explained a variety of other tests used for specific purposes, such as a tympanometry test, which can measure how well the middle ear mechanisms are transmitting energy based on air pressure variations in the ear canal (cool!). Since my test results showed no problems, the pure tone test was all that was required in my case. My audiologist stressed the importance of attaining baseline hearing data via regular screenings (at least every couple of years). She told me that, besides serving as an early warning of hearing loss, the baseline test results can be critical in a legal sense, such as allowing a person to prove that an accident was the cause of hearing loss. Numerous hearing health establishments, including Hearing Health USA, where I got my test, offer free annual hearing screenings. It’s free and quick and can allow us to preserve our most precious professional asset for years to come, so there’s little reason not to go. To find a hearing center near you, visit hearinghealthusa.com.